The PLUS Decorations Rollers make adding a personalized accent to any item quick and easy. You can use them to decorate gift cards, tags, wrapping paper, scrapbook pages, party & home décor items and so much more. The PLUS Decoration Rollers are self-inking; therefore, you can roll out a continuous long pattern without having to lift up the roller to re-ink the stamp. This is in stark contrast to the procedure you would have to follow to create a similar pattern using a single rubber stamp and inkpad. 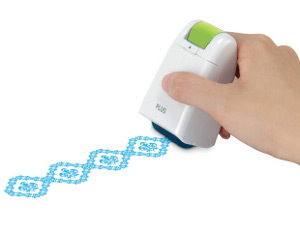 Since you no longer have to stop each time you stamp an image to re-ink the surface nor to line up each stamped image, this tool is a real time saver. The patterns are continuous so you get to decide when you want to end the image on your project. According to the manufacturer, the ink on the Decoration rollers is acid-free and safe to use in your scrapbooking projects. The rollers are easy to use. You just click the unit and roll. Using even firm pressure to slowly roll the product over the area you wish to decorate. The mini rollers are a great size for accenting tags, cards, and other small projects. The pattern width on the mini Deco Roller is approximately 1/2 inch (1.25 centimeters). Additionally, the mini rollers are great for curved surfaces. I used the mini roller to stamp a paper cup and the results were excellent. The mini roller comes with a convenient cover to protect the image when not in use. The manufacturer sells additional cartridges separately, so you can add to your collection without having to buy another unit. Each cartridge is color coded so you can easily see what color ink they are. So you can collect several rollers in assorted patterns and use them with the same cartridge. I tested the rollers on cardstock, assorted papers (which included a handmade paper) and vellum. Since the ink dries so quickly, the results were consistently good. The manufacturer does recommend that you test the ink on a scrap piece of paper before using it on your project, so that you can decided if you like how ink works on that particular paper type. I also tested the Decoration Roller on glossy paper, parchment paper and vellum. The ink dries very quickly. It did not dry on the glossy paper. The manufacturers warn that these rollers are not created to use on those two papers because the ink with either not set or take a long time to dry. I found my results to be consistent with the manufacturers prediction. Do they come in different designs? That would be great because I would rather roll these across to make my design go quicker. I like the fact that you can get new cartridges instead of throwing them away to save on waste and they tend to be stronger. I like when I can read a review on a product before I buy it to see if it is worth my time. These rollers will make card making or scrap booking so much easier and I am anxious to see what designs they offer.Thanks for your review. Sounds like a really cool stamp!